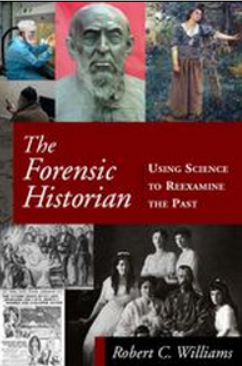 Joe Marino sent along some details about a book he discovered, "The Forensic Historian: Using Science to Reexamine the Past" by Robert C. Williams (Armonk, NY: M.E. Sharpe, 2013). It is interesting that this book was published in February of last year and has not surfaced, that I know of, in online shroud discussions. The book is available at Amazon.com in Kindle format and as an ebook from the publisher, in each case for $12.95. A hardcover will set you back about $50.00 and a paperback $18.95; Barnes and Noble seems to have the best prices. This engaging book examines 20 significant cases where investigators have applied new forensic techniques to confirm, dispute, or revise accepted historical accounts. Examples include the murder of King Tut, the validity of the Vinland Map, the authenticity of the Hitler diaries, Joan of Arc’s ashes, the bones of Anastasia, arsenic and the death of Napoleon, and the dating of the Shroud of Turin. I must buy the book if for nothing else than the piece about Paul Coreman. In fact, I just punched in an order. I’ll look at it in the context of the shroud, next week, time permitting. The case of the Shroud of Turin showed how modern forensics techniques, again using analytical chemistry and mass spectrometry, could date fairly precisely any material object of which there was a sample available. For centuries, the shroud had been a venerated relic of the church. Critics had their suspicions, but no hard science to back them up. In the end, Walter McCrone was able to show that the reddish stains on the linen were red ochre paint, not blood, and that the linen itself dated from the fourteenth century. Case closed. Except that in December 2011, Italian scientists claimed that the shroud could not have been a medieval forgery and that the marks on it were made by electromagnetic energy. Lasers were not around in the first century, so something miraculous must have happened. Forensic history had produced convincing evidence regarding the Shroud of Turin. And yet the debate goes on. Forensic history, like history, remains an argument without end. In 1985 scientist Thomas Cahill of the Crocker Nuclear Laboratory at the University of California, Davis, used PIXE Particle-Induced X-Ray Emission) to examine the Vinland Map. He found that titanium oxide was not a major part of the ink, but only trace amounts. (Cahill’s samples were much larger than McCrone’s.) Since Cahill’s results appeared to contradict McCrone, Yale promptly sought Cahill’s second opinion. McCrone responded in 1988 with a complete, published account of his 1974 results, arguing that the Cahill tests did not invalidate them. In fact, PIXE could identify titanium but not titanium dioxide. In 1995 Kirsten Seaver–a historian of medieval Norse culture and fellow of the Royal Geographical Society–argued that the Vinland Map was indeed a modern forgery and that she had identified the probable forger, an Austrian Jesuit priest name Father Josef Fischer, who had died in 1944. Neither Seaver nor McCrone were invited to contribute to a lavish second edition of The Vinland Map and the Tatar Relation published that year by Yale University Press. (The more favorably inclined Thomas Cahill was invited instead.) Nor were McCrone and Seaver invited to attend the February 10, 1996, conference in New Haven where the map was displayed under armed guard and insured for an inflated value of $25 million. McCrone showed up uninvited anyway and handed out to participants his own unpublished paper titled "The Yale contingent was not amused to have a skunk at its garden party. In 1999 McCrone returned to the fray by publishing in his own journal Microscope the results of his more recent study of the map. He had examined samples of the yellow ink liner from the map using a polarized light microscope to confirm the presence of synthetic anatase. He also found that the reddish fringe was not rust but a collagen tempera. Three years later, another scientist complicated the situation with radiocarbon dating: D.J. 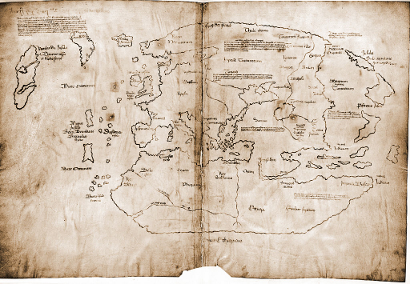 Donahue found that the parchment of the Vinland Map indeed could be dated from the years 1423-1445, but that it had been coated with some substance in the 1950s. In 2004 the analytic chemist Robin Clark supported McCrone’s 1974 results using Raman microscopy: the particle size and distribution of the ink was characteristic of synthetic anatase, not iron-gall ink. Forensics thus played a crucial role in demolishing historical and cartographic claims that the Vinland map was authentic. In particular, analytical chemistry showed that the ink used on the map was a twentieth-century product, even if the parchment and wormholes might have dated from the fifteenth century. The Wikipedia article has very much more on the Vinland map than is posted above. It is an incredible record of scientific contradictions, false inductions, wrong inferences made from inadequate investigations, and the question of authenticity seems to remain quite inconclusive. It seems that C14 testing dated the parchment to 1423-45; there was a subsequent discovery that modern nuclear fall-out had skewed these results. There was the McCrone-Cahill controversy over the presence of titanium in the ink. Subsequent tests brought more uncertainties to light. It seems almost as if whatever comprised the original artifact, which conceivably could have been quite genuine, has subsequently been massaged by an enterprising forger, to make the artifact more of a curiosity than it actually was. Despite all the work done on it to date, the matter would seem quite unresolved, until further more conclusive investigations can be implemented. The assertion that McCrone was able to show that the reddish stains on the TS linen were red ochre paint seem to be quite false. McCrone seems to have made this assertion based purely on his visual microscope observation, with nothing better to offer than standing on his dignity. When challenged as to what tests he carried out, he merely claimed to be able to recognise it. I am unaware if any other investigator has concurred with his claims, or has reviewed his work. A variety of chemical tests carried out on the red stains by various other investigators have all confirmed that the stains comprise primate blood. So much for dabblers in forensic science. This shows that even if the shroud was carbon dated to the first century skeptics will still disbelieve.